Nerissa's Life: Happy New Year! It isn't? Really? Are you absolutely sure? But technically, it could be my birthday. It's not like you actually know the actual day I was born. I mean, I arrived at the back door already all grown-up, so there's a good chance today IS my birthday after all. What's that, Peepers? The chance of today bein' my actual birthday isn't actually good? But they do look a lot alike. I mean, they both wear diapers. In public. Don't bother covering 'em up or anythin'. MOUSES! Baby New Year... The personification of the birth of the new year. 2017 is all of one day old. Well almost. Almost, here in Canada. Guess he won't really be a whole day old 'til tomorrow, right? And I'm assumin' he is a he. I think Baby New Year is a boy baby. He looks like a boy baby. So I guess that makes 2017 a boy, too. You know, before thinkin' that through, I didn't realize years were male or female. I always thought they were just... Well... Years. Peepers, I don't see why we can't just say that January 1st is my birthday. I mean, odds or no odds... By the way, if you have no odds, does that make the odds better? Fact is Peepers, as of right now, I don't have an actual birthday. I don't have an actual date of birth. And yet, I was born, and so I must. So why the mouses can't we just say January 1st is my birthday and be done with it? Do I have to explain everythin' to you, Peepers? Everyone celebrates New Year's Day, BIG time. It's even a holiday in most places. So if I choose January 1st to be MY birthday, then everyone will be celebratin' on my birthday, and in a way, they'll be celebratin' me. All those New Year's Eve parties will be celebratin' my birthday to come. And then at the stroke of midnight, they'll be cheerin' my arrival. Then on New Year's Day, they'll be sayin' "HAPPY NEW YEAR!" which will kinda be like code for "Happy Birthday Sivvers!" 'cause you know, it'll be my birthday and everythin'. What do you mean it doesn't work that way? And you're sure that if I choose January 1st to be my birthday, New Year's Day won't be all about me? 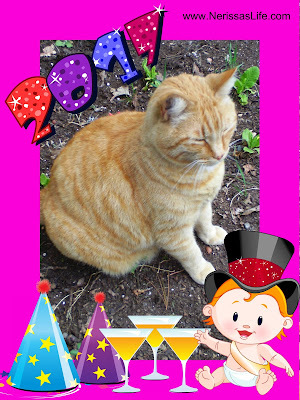 Well I'm not gonna let that stop me from wishin' all my pals a Happy New Year. And if my pals wanna wish me a Happy Birthday back, I'm okay with that. Yup, I'm okay with that, for sure. And please, feel free to send nip. MOUSES! Yous right Seville! Mes thinks EVERYONE should bes able to picks their own birthday! As a batter of fact, mes going to sings yous the song!!! I think so too. And what a BEAUTIFUL singer you are! PURRS. Hey, I think it's as good a day for a birthday as any! Well Happy Birthday on your selected day and Happy New Year from all of us at Brian's Home! Happy New Year and Happy Birthday Seville! We wish you, your fur-sibs and your Peeps all the best in 2017. Happy Birthday anyways MOL! Happy New Year and wishing you a year of happiness and health! And may 2017 be filled with happiness and health for you, too. PURRS. Happy Birthday and a Happy New Year too! Happy birthday to you! AND guess what it is my two brothers birthday as well (appointed by Mom as we don't know for sure what exactly there birthday is). Happy New Year to you Seville and your WHOLE family. 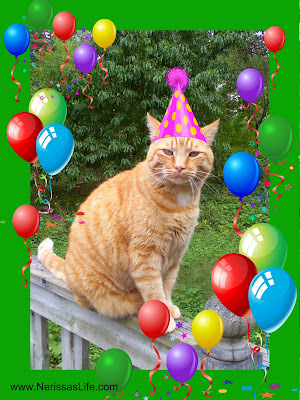 If you want to put party hats on and get into the nip and party, then do so, if you want it to be your birthday then it is. Enjoy, be safe, play safe and keep the great stories coming. The Queen has 2 birthdays so I can't see why you can't have one today. I am going to wish you a happy birthday anyway. You have a good point there! A VERY GOOD POINT, for sure. If our head of state can have two birthdays, I CAN HAVE TWO, TOO! EXCELLENT. Yup, excellent plan, for sure. PURRS. Well, it is the birth of a new year for everybody. Right? Then logic says it is Everyone's Birthday today! Happy New Birthday this year Seville. And Happy New Year too!!! I like that kind of logic, for sure. PURRS. Happy "Could Be" Birthday Seville! Wishing your family an amazing 2017...Happy New Year! And I wish an amazin' 2017 for you and yours, too. PURRS. YOu look so good in that hat I think you should make every day your bday!! I think you can have your birthday today too. Happy birthday !! And a Happy Healthy to all of you including your peeps! I think so, too. And now to inform the peep. MOUSES! Well, Seville, I was born in December, so it does happen. We winter kitties are special! We would like to wish all of you a VERY HAPPY NEW YEAR. 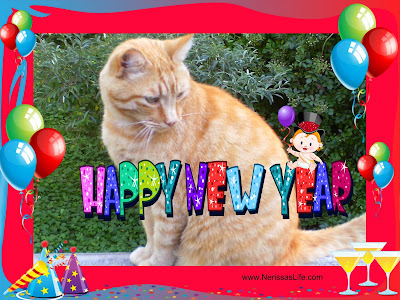 May it bring good health, sunpuddles, treats, cuddles and much adventure! And nip. I'm REALLY hopin' this year will be the year the peep finally learns how to grow the nip. PURRS. I'm hopin' my journey will take me to where the peep can figure out how to grow me some nip. PURRS. And a very Happy New Year to you, too. PURRS. Perch... PERCH! Oh yes, that would be a good thing for the new year to bring, for sure. PURRS. Well, I think I'll wish you a HAPPY MAYBE BIRTHDAY and a HAPPY FOR SURE NEW YEAR! That's got it covered right? My kitties know how you feel. We don't know their birthdays either. I hope you got to do a lot of celebrating on New Years! Happy New Year to you! And a very happy and healthy New Year to both of you, too. PURRS. Happy Birthday and Happy New Year, was epically epic photos today and so much celebrating!!! A kitty has to celebrate a bit on his birthday, for sure. PURRS.